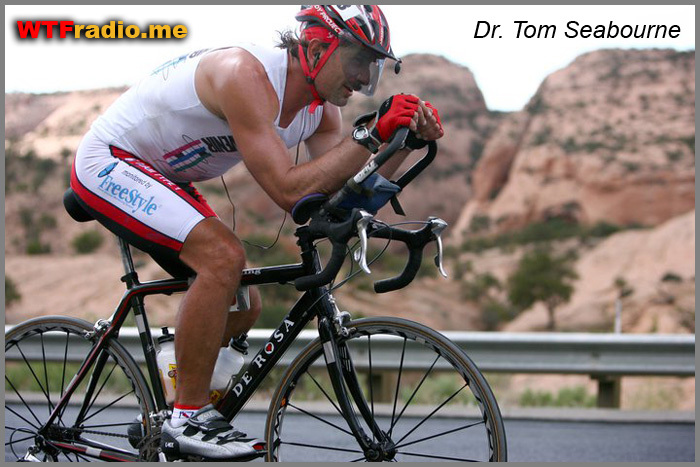 Tom Seaborne is a fitness educator, author, martial artist and cyclist. Tom has a Ph.D in exercise science. He was a member of the US Taekwondo Team, and a National and International AAU Taekwondo Champion. Tom was introduced to me by my Taekwondo instructor Michael J. O'Malley, who appeared on an earlier episode of the feisworld podcast. In addition to Taekwondo, Tom earned the title as an ESPN Professional Karate Association full-contact karate winner. If there are avid cyclists who are listening to this podcast, it’s worth mentioning that Tom was the winner of RAAM Open West, and ranked top 10 in the 1990 Race Across America. Tom also holds a National 12-hr record holder (229 miles), a 24-hr Texas State Cycling Champion (1740 miles in 7 days) and a Guinness World Indoor Cycling Record in 2009 (185 hours). Besides competition, Tom appeared on a number of televisions and video series such as the QVC Fitness Expert. He co-hosted the #1 rated infomercial 6 second abs, Fox Morning Show, Good Morning Texas, Stay Fit ABC, Inside Fitness - CBS National and many others. Tom has authored over 200 articles and 16 books. You can find them on Amazon. What strikes me the most is not the endless list of Tom’s accomplishments as an athlete and an educator, but rather his openness, honesty, and willingness to flex, listen and learn. In Part 1 of our conversation, we dive deep into fitness. As a woman in her 30s, I've been struggling to stay in shape while balancing a demanding job and a busy life (Don't laugh, running a podcast on top of a full time job is a lot of work!). It has become increasingly difficult to keep the pounds off and feel good about what I consume on a daily basis. I've reached a point that I say to myself: I can't work out any harder or to eat better. What else can I do? Since my interview Tom, he has become a true inspiration. A man in his 50s, he has achieved and maintained extraordinary physique. It didn't "just happen" like that, Tom created and sustained a system he was able to share with me. When it comes to dieting, Tom says "If you can't do it for the rest of your life, there's no point in doing it for one day." He also helps demystify many of the misconceptions associated with training such as fitness vs. performance, feeling vs. looking good. In Part 2, we talked about personal life, goals and even challenges as a fitness educator today. I offered Tom some of my own opinions for how an athlete like himself could potentially take advantage of social media beyond Facebook, Twitter, Instagram, etc. For example, Quora allows a fitness expert to answer and curate content. There is so much information out there. We are all drowning in data and starving for useful knowledge. Technology can be the ultimate resource and also the biggest liability. An authentic voice from a trusted expert like Tom can help people navigate the right information, achieve and sustain the results they want. Ubersense is another great example of how fitness experts can coach clients, reach an audience around the world without any travel and right from their homes. There’s no better era than the one we are in today to influence, educate, and help one another. To learn more about Tom, please follow him on Facebook, Twitter, YouTube. Do you enjoy this podcast? If so, please leave your comment below and share the podcast with your family and friends. Your support will keep me on track and bring many other unsung heroes to this podcast. Alexander Kjerulf: Chief Happiness Officer at Woohoo Inc.